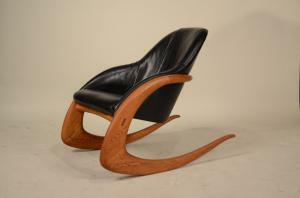 Wendell Castle black leather crescent rocker. 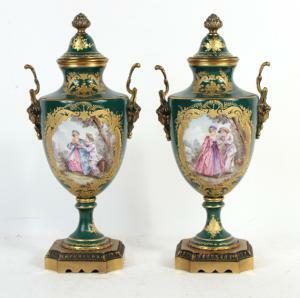 Pair of gilt metal mounted porcelain covered urns. 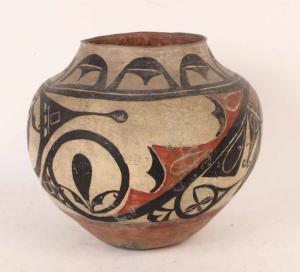 Polychrome Acoma olla, circa 1904, with bands of checkerboard decoration in black enclosing red abstract design. 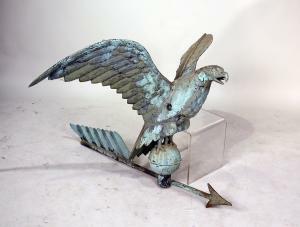 Copper spread wing eagle weathervane, made in New England in the 19th or 20th century. 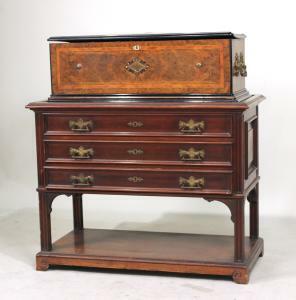 Continental 19th century inlaid walnut music box on stand, together with nine musical cylinders. “Wawapek” was the Queen Anne-style home of the de Forests, a family so deeply rooted in New York history it dates back 300 years to the days of the Huguenots. BLOOMFIELD, N.J., UNITED STATES, July 13, 2018 /EINPresswire.com/ -- BLOOMFIELD, N.J. – Items from the estate home in Cold Spring Harbor, Long Island known as “Wawapek” – the Queen Anne-style residence of the de Forests, a family so deeply rooted in New York history it dates back 300 years to the days of the early Huguenot settlers in Manhattan – will come up for bid in a two-day sale planned for July 25-26 by Nye & Company Auctioneers. The auction will be held in Nye & Company’s gallery, located at 20 Beach Street in Bloomfield. The full catalog is available for viewing now, at www.nyeandcompany.com, as well as on the internet bidding platforms LiveAuctioneers.com and Invaluable.com. The Wednesday, July 25th session will have live and internet bidding. The Thursday, July 26th session will be internet only. Many of the items in “Wawapek” – a stately Gilded Age mansion built in 1897 and occupied by the de Forest family up until this year – will be in the sale, to include yachting trophies, Native American pots and baskets, American glass, and European and Mexican pottery (some of which was exhibited at the Metropolitan Museum of Art, where Robert de Forest served as president). Also from the de Forest estate will be numerous period furniture pieces (much of it New York in origin), steamer trunks (to include examples by Louis Vuitton, Goyard and others), and even a rare and simple pine box that Tiffany & Company used as a shipping crate that bears their label. An aside: the de Forests were close friends with Louis C. Tiffany and called him “Uncle Louis”. While the de Forest estate is the auction’s undisputed headliner, it’s not all that’s in the sale. Also up for bid will be original calendar art by Howard Pyle (Am., 1853-1911), signed “H. Pyle” lower left and depicting a woman with a jug and ravens, plus 11 loose calendar pages, to include the page being sold; and a pair of seven-light blackamoor torcheres (stands for holding lamps). Also being sold, for fans of Bruce Springsteen and the E Street Band, are pieces of Baroque-style furniture that were previously in the wine room of the home of “Mighty Max” Weinberg (Am., b. 1951), the longtime drummer for the E Street band and bandleader for Conan O’Brien on both of O’Brien’s late-night shows. The wine room is one of Weinberg’s favorite places in the home. Furniture pulled from “Wawapek” will feature a Wendell Castle black leather crescent rocker, a Queen Anne gumwood kasten made in the 18th century in New York (possibly Long Island), a circa 1815 Neoclassical mahoganized recamier (fainting couch) probably made in New York, and a Continental inlaid walnut music box on a stand, in working condition with extra cylinders. Decorative accessories from “Wawapek” will include a copper spread wing eagle weathervane, an English late 18th century George III mahogany dual barometer/thermometer, a floral-decorated Delft garniture set attributed to Justus Brouwer (Dutch, active 1739-1775), and a pair of 19th or 20th century yellow-brown glazed European wine jugs, probably handcrafted in France. Native American objects from the de Forest estate will feature a pair of fine Trios (or Zia) polychrome storage jars, an oval Pomo basket with shell decoration and a Southwest Indian coil basket, circa 1900, with geometric four-point stepped star design. Also sold will be a large size Gothic doll house, a Larchmont Yacht Club 1913 season picnic hamper and an oil on canvas portrait of Cornelius Van Tromp (1620-1691), with an illegible inscription and “Amsterdam”. The de Forest family’s U.S. history can be traced to Jesse de Forest (1576-1624), the leader of a group of Walloon Huguenots who fled Europe and religious persecution. They emigrated to New York, where de Forest’s plan was to found New-Belgium, so the group could peacefully practice their Reformed Protestant Christianity. He sought permission from the Dutch to establish a colony in what is now New York City and was granted permission in 1624. That year a group of sixty families of Walloons and Dutch Protestants settled in what they called New Amsterdam. Fast forward to Robert W. De Forest (1848-1931), Jesse’s descendant, who was general counsel for the Central Railroad from 1874-1924 and director of the New York & Long Branch railroad, All-America Cables and the Metropolitan Life Insurance Company. He was New York City’s first Tenement House Commissioner and became the president of the newly formed National Housing Association of New York in 1910. De Forest was also president of the American Red Cross, the Russell Sage Foundation and the Metropolitan Museum of Art (1913-1931). De Forest and his wife, the former Emily Johnston, built the American wing of the museum. Ms. Johnston was the daughter of the Met’s first president and co-founder, John Taylor Johnston (1820-1893). Start times both days will be 10 am Eastern. Phone and absentee bids will be accepted for day one of the auction. Previews will be held in the Bloomfield gallery Monday-Friday, July 16-20, from 10-4; Sunday, July 22nd, from noon-4 pm; and Monday-Thursday, July 23-26, from 10-4. For more information about Nye & Company Auctioneers and the auction scheduled for July 25th and 26th, please visit www.nyeandcompany.com. The full color catalog is available for viewing at www.nyeandcompany.com, www.LiveAuctioneers.com and www.Invaluable.com.